Yep, it is still snowing. 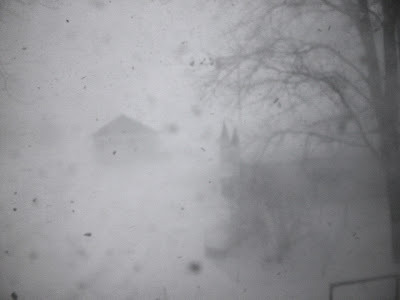 Add a bit of wind (actually, more than a bit) and some really cold temperatures (+10*F) and you have yourself a blizzard!! What a great day to stay inside, bake bread, and do a ton of laundry. Wishing all of you warmth. No blizzarding here, but 20 below tonight. As you may recall, we’re 30 miles south of Chicago & it’s -5 degrees here right now (it’s also 4:30 am). I hope this will help to cut down on next summer’s mosquitoes!